Description: 2635 works the yard while power sits outside the shops. Description: Half primer, half sandblasted CP paint, half god knows what else, 3001 looks to have seen better days. 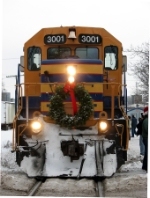 Title: Merry Christmas From Marquette Rail! Title: In Your Face, Holiday Style!